What is a Parish Plan? In 2006, a White Paper on Local Government expressed an aim of ‘Giving local people and local communities more influence and power to improve lives’. 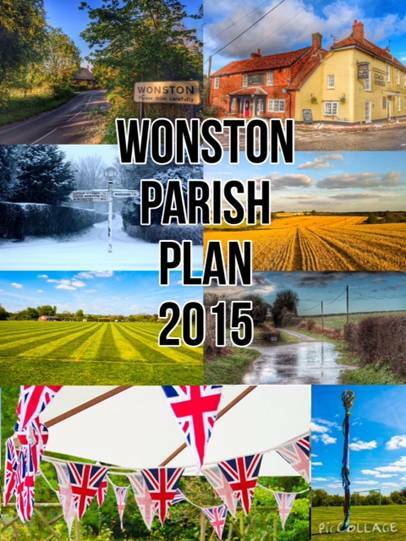 This aim materialised in the form of a Parish Plan which, for Wonston Parish, is a document setting out how we, the residents, want to see the local community evolve over the next five years. The contents of our Plan are an amalgam of what the community has fed in via various inputs, not least the comprehensive questionnaire which gave the opportunity for every household to have their say. Importantly, the Parish Plan has the potential to provide influence and it identifies a number of actions to be taken to try and achieve how the community’s vision for the future can be realised. The Plan is a living document and will be reviewed on a regular basis by the Parish Council to ensure that actions identified continue to be taken forward and implemented. How has the Parish Plan been produced? The Parish Council has overall responsibility for the Plan, but the essential nature of a Parish Plan is that it is produced by a Steering Group of volunteers from the community, including involvement by a member of the Parish Council. The Plan was launched at the Annual Parish Assembly in May 2012 with the assistance of Steve Lincoln, Community Planning Manager, Winchester City Council. Thereafter, canvassing of people took place at various events around the Parish. The process was considerably protracted as a result of the leading member having to withdraw for family reasons, which resulted in a period of inactivity. However, once restarted, the process regained momentum, with enthusiastic participation by the Steering Group. This resulted in production of the questionnaire, with households being urged to complete it online, though hard copies were made available, courtesy of the Dever Stores in Sutton Scotney. A total of 188 responses were received,a return rate of 31%. Once the results had been analysed, the Plan was then constructed. After a number of alterations, the Plan was finally issued in September 2014. The Parish of Wonston lies 5 miles north of the centre of Winchester and consists of the villages of Sutton Scotney, Wonston, Hunton, Stoke Charity and Norton. Although historically designated as Wonston Parish, some two thirds of the Parish population live in its next-door neighbour village of Sutton Scotney. The Parish covers an area of 5,493 acres, of which 8 are covered by water. 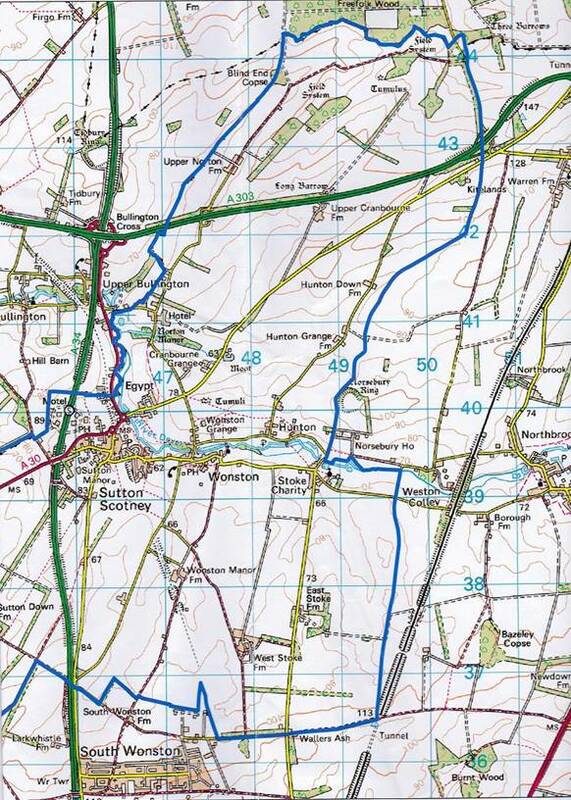 The River Dever runs through the villages of Stoke Charity, Hunton, Wonston, Sutton Scotney and Norton. The greater part of the land is included in the northern slope of the high ridge of downland which rises north-west of Winchester and slopes down towards the north to the tributary of the Test as it runs a generally north-western course through the centre of Wonston Parish. The Parish boundaries from east to west narrow near the river, which is where the village of Wonston is situated, west of which is the larger and more significant village of Sutton Scotney. Sutton Scotney. This is an old village, extended in modern times, at the point where the old Winchester to Oxford and London to Salisbury roads met. Not only has the village been bypassed by the A34 but the railway which ran from Didcot to Winchester has long since been closed. One of the main features of the village is Sutton Manor, home for elderly people, also Naomi House and Jack’s Place, a hospice for children and young adults. Other significant features of the village are the Victoria Diamond Jubilee Institute, opened in 1897, the Dever Stores which has a Post Office, the Coach and Horses Inn, and the Gratton recreation ground which was purchased from the Rank Foundation in 2013 and is leased to the Gratton Trust. North of Sutton Scotney are Cranborne and Norton Farms, the centres of the original manors of Cranborne and Norton, the lands of which stretch away in a long narrow piece of land of about two miles of open field and downland to a dark clump of woodland which covers the north-east corner of the Parish. This joins the south-eastern edge of the Freefolk Woods as they run west and form the northern boundary of the Parish. Two roads from Winchester lead to Wonston; one the road through the Worthies and Stoke Charity which approaches Wonston from the east; the other, the Roman road to Andover, which runs north-west from the city then close past the west end of South Wonston up to Sutton Scotney. Leaving Sutton Scotney at the south end of the village and turning east, the road leads to the village of Wonston. Wonston. There used to be a set of stocks on ‘The Green’ but the village still has many old buildings, including The Old House - the former rectory to the church - which is mediaeval and the oldest parts date back to the late Fourteenth Century. There are also thatched cottages of 16th, 17th, 18th and 19thCentury origin. Holy Trinity, a typical mediaeval church, has had a chequered history, having been twice ravaged by fire, first in 1714 and again in 1908. Another building of historical interest, but no longer in being, was a factory built by Vickers in the Second World War for assembling and storing aircraft parts. The Wonston Arms public house continues to provide a key amenity for the local community. Continuing east from Wonston, the road leads to the village of Stoke Charity. Stoke Charity. The most notable feature of this village is the Norman church of St Mary and St Michael, included in Simon Jenkins’ book of ‘1,000 Best English Churches’, and also described by John Betjeman as ‘gem-like’. Besides cottages dating back to the 16th and 17th Centuries, the principal building is the 16th Century Michaelmas House, which was probably originally the Manor Farm. Close by is the River Dever with a lake, formerly watercress beds and, before that, the manor’s fishponds. Leaving the lake to the right, the road bends round to the left past active watercress beds and into Hunton. This hamlet is dominated by Hunton Manor, built in the 18th Century, below which is a cluster of pretty thatched cottages. There is also the tiny church of St James, nestling in a meadow alongside the River Dever and first referred to in 1291. For the remaining part of the Parish, if one sets off from the north end of Sutton Scotney over the road bridge across the River Dever, this area is called Egypt, probably because it was frequented by gypsy travellers. Continuing in a north-easterly direction for about three-quarters of a mile, the road comes to Cranbourne and a little further up the road is the entrance to Norton Park Hotel. Norton. The principal building in this hamlet is the Manor House, mainly of early 18th Century origin, which was in private ownership by families such as Bond (of Basildon Bond stationery) and Tate (of Tate and Lyle) until 1999 when it was converted into a country house hotel. The soil of the whole Parish is loam with a subsoil of chalk, and the chief crops grown on the 3,964¾ acres of arable land are wheat, barley, oats, and turnips. Although the Parish is generally speaking well wooded, there is very little woodland, only 148½ acres, and that mostly in the north-east corner, while 1,003½ acres are given up to pasture land. Farming is therefore a prime activity throughout Wonston Parish. However, it is worth adding that there are some 82 businesses currently trading in Sutton Scotney alone, despite the Parish being essentially rural. The population of the Parish changed significantly during the period of the past two official censuses of 2001 and 2011. The Census shows that, whilst the overall number of residents in the Parish grew by 12.7% between 2001 and 2011, the number of those aged over 60 grew by just under 20%. The trend has been clearly upwards and may have continued between 2011 and 2014. In any case, there are material implications for such services as medical and care facilities, community transport requirements and leisure requirements. 3% indicated that they were in need. For those unable to move, 71% gave their reason as the price of home to buy. Affordable properties for those people wishing to purchase. Affordable homes are planned for Old Station Yard, otherwise no further developments within the Parish are planned for the foreseeable future, despite 82% of respondents (Q13) wishing to remain in the Parish. (Q14/15) Further housing development in the Parish 48% of respondents supported further development in the Parish in principle. However, 72% of those who did not support development in principle were in favour of supporting housing development if it were restricted to the needs of local people only. Development of housing, which could be afforded by local people. Wonston Parish Council will consider further sites for affordable housing development within the Parish. The most important factor at 99% of respondents is being in the countryside, closely followed at 98% by quiet environment. Good local facilities, community life and good road/rail connections were close behind. Clearly being in the countryside and living in a quiet environment are extremely important factors. Preservation of good local facilities, community life and good road/rail connections are also strong factors in why people live in Wonston Parish. Being in the countryside and living in a quiet environment. Winchester City Council’s Local Development Plan does not pose a threat to the Countryside. However, development of Micheldever New Town, if it were ever to happen would have a radical effect on the countryside with the Parish. It would be up to Wonston Parish Council to take Parishioners views into account were a planning application to be made. Good local facilities. The maintenance of these depends on usage by Parishioners. However, from time to time, Wonston Parish Council will remind people to make regular use of local facilities via such means as the West Dever News. Community Life. This is partly dependent on Parishioners interacting but also on the provision of such things as good recreational facilities and activities. These are addressed under subsequent questions. Good road/rail connections. At present these are satisfactory but Wonston Parish Council will undertake to try and ensure that these are maintained. Views on the facilities were sought with respect to age groups. For those between 0-10 years, 24% of respondents considered the facilities ‘Very Good’ or ‘Good’, with approximately 28% considering them to be ‘Adequate”. The lowest scores were for ages 11 – 19 where the facilities rated as ‘Very Good’ or ‘Good’ averaged only 7.5% with ‘Adequate’ at 12%. thereafter the percentages rose, though none achieved 50% through a combination of ‘Very Good’, ‘Good’ and ‘Adequate’. The results from the questionnaire indicate that the needs of the age group 11 -19 are the highest priority, though the results also demonstrate that attention needs to be paid to all age groups, with a long term plan being required. Wonston Parish Council, in conjunction with The Gratton Trust, will undertake a needs analysis of Social and Sports facilities in the Parish. (Q20) The quality of current community facilities in the Parish Overall the quality of these facilities was deemed satisfactory if ‘Very Good’, ‘Good’ and ‘Adequate’ are taken together. The one exception was the Gratton Play Park, where 22% of respondents considered the facility to be ‘Poor’ or ‘Very Poor’. Clearly there is a wish to have good quality community facilities wherever possible and this is acknowledged by Wonston Parish Council, the Victoria Hall Trust and the Gratton Trust. The Gratton Trust is currently undertaking a major upgrade of the facilities on the Gratton Playing Fields. Other improvements will as always be subject to availability of funds. Provision of activities and equipment indicated via the questionnaire. Two very popular items are seating and picnic tables. Besides the major upgrade already being undertaken by the Gratton Trust, the Trustees will have an early look into providing the relatively low cost seating and picnic tables. The Trustees of the Gratton Trust will examine the list of suggestions and incorporate those selected into their Business Plan. Help raise funds for the Gratton. 74% said they would be willing. Join a User Group to help determine how the Gratton develops. 30% said they would be willing. Organise events that are held at the Gratton. 49% said they would be willing. The desired outcome is that those who indicated a willingness to give active support to the Gratton would do so in practice. Also that the Gratton Trust would try to accommodate such an encouraging number of volunteers. The Trustees of the Gratton Trust will make contact with the volunteers to add them to their database and make use of their services in due course. (Q24) The Victoria Hall Parishioners were asked to rate a number of facilities at the Victoria Hall. Top priority was provision of an outside notice board of future events, followed by provision of a fridge, installation of a modern kitchen with cooking facilities, then sound and lighting equipment, followed closely by car park lighting. The Victoria Hall Committee will consider the outcome of the questionnaire and make decisions on which facilities to fund. (Q25) Suggestions for improving or making better use of the Victoria Hall Respondents were asked to provide suggestions and this resulted in 22 being made. Provision of what respondents have suggested where these are feasible, widely sought and affordable. The Victoria Hall Committee will examine the list of suggestions and incorporate those selected into their forward plan. Help raise funds for the Victoria Hall. 72% said they would be willing. Help organise events that are held at the Victoria Hall. 44% said they would be willing. Join a User Group to help determine how the Victoria Hall develops. 38% said they would be willing. The desired outcome is that those who indicated a willingness to give active support to the Victoria Hall would do so in practice. Also that the Victoria Hall Committee would try and accommodate such an encouraging number of volunteers. The Victoria Hall Committee will make contact with the volunteers to make use of their services in due course. (Q28) Activities and facilities in the Parish People were asked which they would attend if they were available, depending on how important they considered them to be. The most popular choices were Cinema Club (56%), Community Café (50%), Crafts/design/sewing workshops (48%), and Youth Club (42%). Other popular choices were Photography Club (38%), Computers for over 50’s (37%), and Adult Drama Group (35%). The remaining three were WI (27%), Internet Café (24%) and Chess Club (13%) A number of other suggestions were also made by respondents. Implementation of desired activities and facilities where these are feasible, sufficiently supported, attract sufficient volunteers to help where required, and able to recruit an appropriate person to run the activity or facility. These will be subject to an initial discussion between Wonston Parish Council, the Gratton Trust and the Victoria Hall Committee, leading to the potentialsetting up of activities and facilities for Parishioners. (Q29) Respondents were asked if they would be interested in helping to run any of the activities and facilities listed in Question 28. This resulted in 14 people expressing an interest. The desired outcome is that those who have expressed an interest would do so in practice and that these activities and facilities will be initiated. (Q30) People were asked to suggest other groups or activities they would like to see happening. There were 19 respondents with suggestions as follows: sports for all such as a toddler and baby exercise group, a running club, yoga or tai-chi; bridge; tea dances; athletic clubs for 11 – 15 year olds; book club; Zen group; over 50s keep fit; playgroups for under school age children; table tennis; Scrabble; walks available on weekends; youth club 14+, maybe incorporated with the cinema club occasionally; tenants association;Parish to buy and lease the Taylor’s building for a community centre/café/shop etc; church activities such as Messy Church; cricket team and matches; tennis club; judo; kids cycling club.